Last summer, I was lucky enough to see a fantastic open air production of The Taming of The Shrew by the Red Rose Chain Theatre Company at Jimmy’s Farm, near Ipswich. 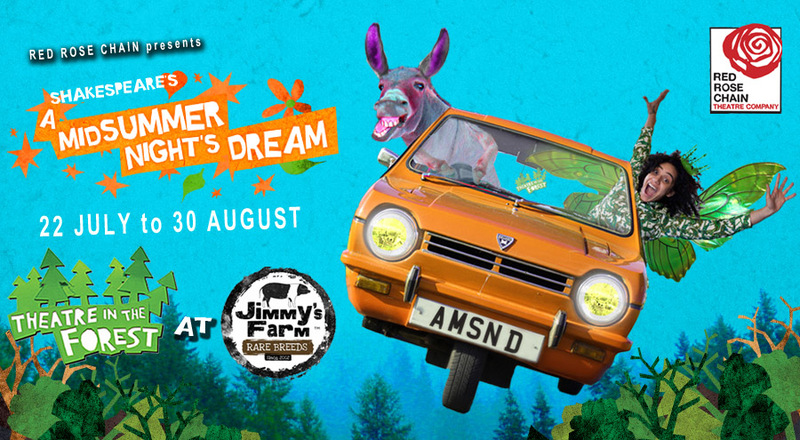 This year, this incredibly talented theatre company is back with an exciting reinvention of everyone’s favourite Shakespeare comedy, A Midsummer Night’s Dream. If last year’s production is anything to go by, then this year’s will be absolutely hilarious. Red Rose Chain productions are a brilliant example of what results when you mix highly creative directing with inspired acting and exceptional comic timing with imaginative performance: an eye wateringly funny play. To add to the delight, Jimmy’s Farm’s theatre is actually in a forest. This is the absolute ideal place to watch A Midsummer Night’s Dream. A genuine wood, enchanting lighting, moonlight, stars and magic. I can’t wait. What’s more, it’s one of those theatre events where you’re encouraged to enjoy more than the play – so, bring your out door chairs, your picnic baskets and a blanket, some pop for the kids and bottle of vino for yourselves, enjoy the feast and raise a merry glass to the happy couples. Red Rose Chain will be performing A Midsummer Night’s Dream from 22nd July to 30th August 2015. Sun 30th August at 7.30pm.